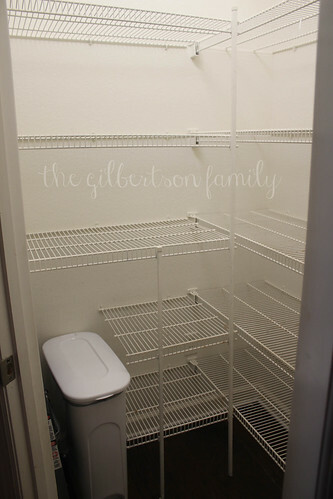 Before I begin, I want to throw it back to what our kitchen looked like when we moved in, and the projects that the pantry has already undergone. 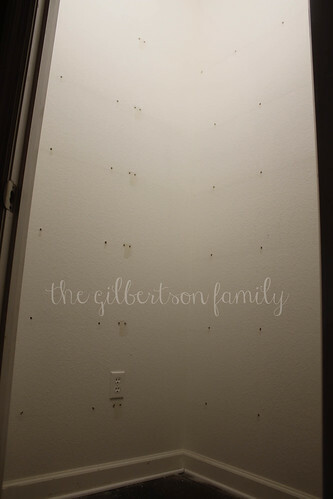 This poor pantry has been through a lot, beginning with that huge hole in the wall. 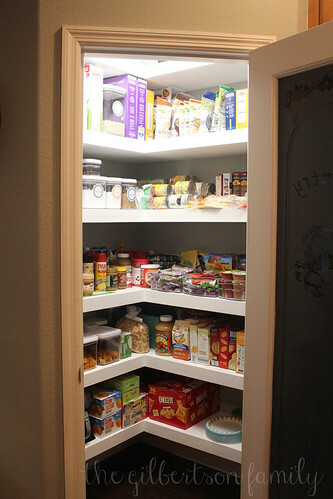 Fast forward to the present day and our pantry ended up looking like this. 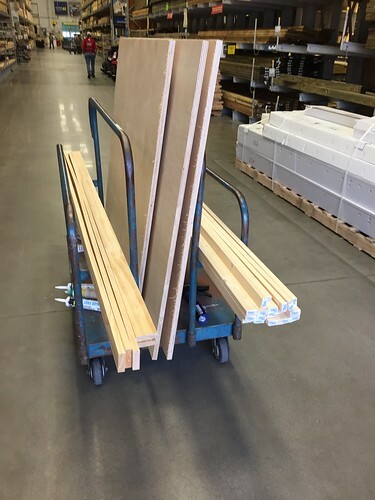 I was growing more frustrated with the builder grade wire shelves and the amount of stuff we were accumulating was weighing down each shelf. So, we got to work. 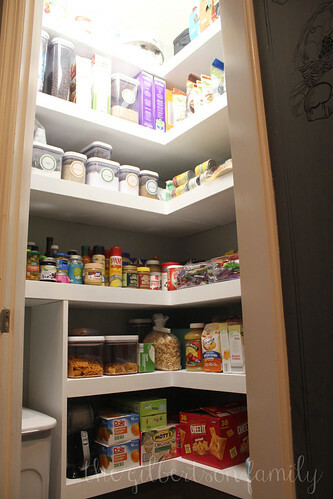 While it as a big undertaking, I was so happy to start taking everything out of the pantry. There was food in there that was long expired and owner’s manuals piling up for product that we don’t even own anymore. If I had any doubt that we would use it or eat it, it went in the garbage. I bagged up everything else in totes and reusable grocery bags and put them in the laundry room for later. Greg removed all of the shelves, filled all of the holes, sanded, and we both painted. We went with the same color grey that was on our walls since we already had the paint. Leading up to the big project, Greg had done a lot of work on the back end. He researched the best possible options for shelves and went through all of the links I sent him that I found on Pinterest. We landed on floating shelves because they look nice and clean, but are also very sturdy. 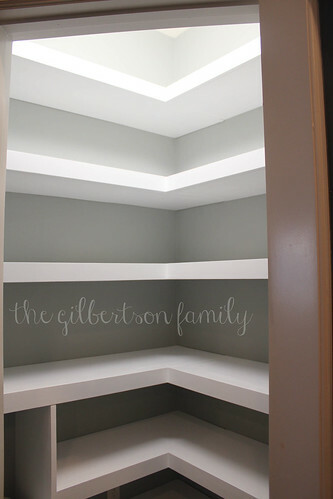 Greg built and painted all of the shelves beforehand so once the pantry was ready, he could start installing the shelves. My absolute favorite part is the little cove for our garbage can. 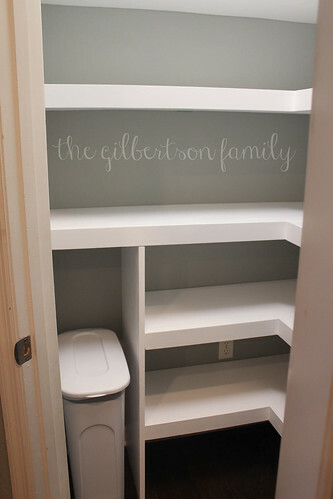 Due to the awkward hole in the wall, the wire shelves were cut, always leaving that little space for the garbage can. But, now it looks so much cleaner like the garbage can is meant for that space. Greg put in a lot of hard work on these shelves and I would love to say they were installed without a single hitch, but it was a process. 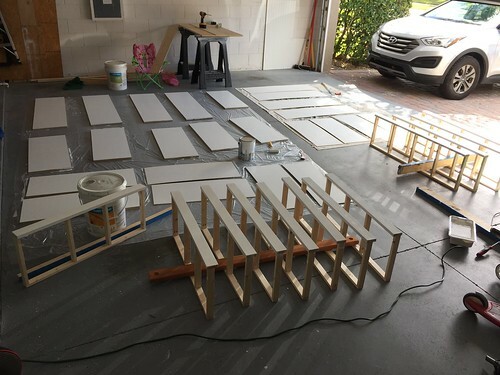 He went back and forth from the kitchen to the garage on numerous occasions to cut, and re-cut, to make them fit (builders don’t particularly care to make sure everything is perfectly square when framing). Then, there was a lot of touch up paint that needed to be applied, and a few choice words that were used in the process. But, his hard work did not go unnoticed and it totally paid off. 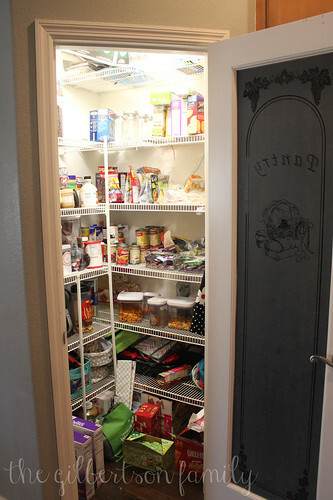 The pantry looks so amazing! Once he was finished, I got in there to put everything back in it’s new and improved spot. 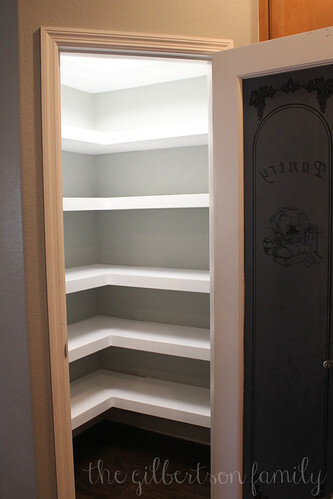 Organizing the pantry alone would have made a difference, but the paint and new shelves make a HUGE difference. It is so much easier to find that things we need. I have found myself not buying things that we don’t need since I know what we have now! After a couple of months, I am happy to report that the pantry is still very organized, though the floor has acquired a few boxes here and there. As far as the door, I love having the chalkboard on the front and it gets a lot of use for our weekly menu, but it has some wear and tear. I would like to remove the contact paper and paint the class with chalkboard paint. Hopefully I can accomplish that in 2017!